Moving house is a life-changing event that involves a lot of important decisions. Now that you have established the exact type of the home that you are about to purchase and the neighborhood where it will be situated, it is time to think about some special features and layout of your new home. How many times have you imagined your perfect house with a breathtaking garden and a swimming pool? Now that you have a chance to move to a house with an outdoor swimming pool, it is time to consider all positive and negative aspects of moving to a house with a swimming pool. Living in house where you can have access to a swimming pool any time you want is a dream come true. It’s like you are on vacation every day. Fantasizing about it seems so appealing, but the truth is that owning a house with a swimming pool is a very demanding affair that requires a lot of work. When planning to move to a house with an outdoor swimming pool, be mindful of the following considerations. – Decide whether you can afford having a swimming pool given all the costs that are associated to it. Moving to a house with a pool means higher electric and water bills, home insurance, pool service costs (filtration system, repairing cracks, siding and ladders, installing and replacing pumps and motors,…). – Inspect the swimming pool so as to confirm that there is no any serious damage that could cost you a lot once you start doing the repair work. You just need to find a reliable person that can inspect the pool for you. Knowing the current condition of the pool will help you identify potential issues and investments. – Make safety your top priority, especially if you have small children. Make sure your pool is gated and locked so that your child cannot access it without your permission and supervision. A proper fence with a locking gate will keep your children and pets away. Your swimming pool should comply with local safety requirements and standards. Each city has its own regulations when it comes to the size of the pool and water depth. Those items are available at your local pool store, where you can get all necessary supplies and instruction how to use them. Once you have determined all benefits and disadvantages of owning a house with a swimming pool, you can decide whether moving to a similar place is an ideal solution for you. No matter how appealing it may seem, having a pool is a huge responsibility that comes with some significant investments. Considering all pros and cons, people are usually reluctant to purchase a house with an outdoor swimming pool. If you eventually decide to go for it, make sure you enjoy yourself and spend the most amazing time at the pool. 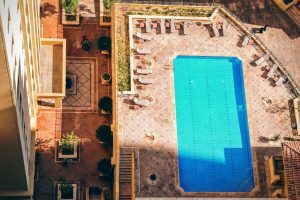 Buying a property with a backyard pool is a significant undertaking, just make sure you are ready for this kind of commitment.